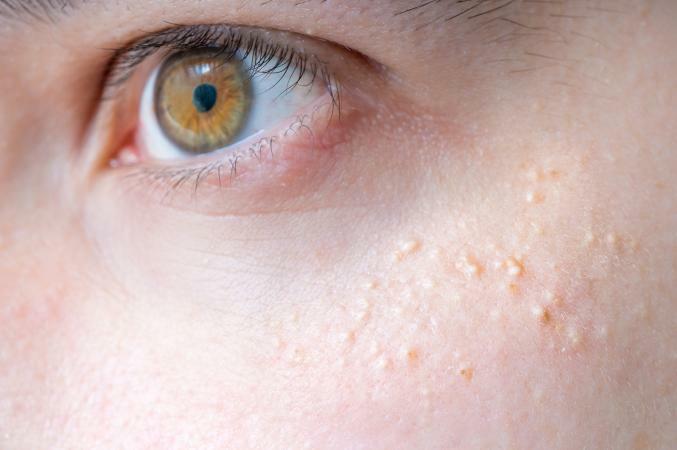 While many people who suffer from milia tend to think they need acne treatments to rid their problem, acne cleansers will not treat the underlying milia condition. Because milia is caused by trapped oil underneath the skin's surface, you may want to cleanse daily with a product containing an alpha hydroxy or glycolic acid for best results. The best facial wash for milia prone skin will include an exfoliant of some sort to remove and dislodge embedded dead skin cells and oil. Whether you opt for an over-the-counter cleanser or a prescribed wash from your dermatologist, you'll want to make sure the cleanser is mild enough to use daily for best results. The following cleansers can be used for milia-prone skin. Each has pros and cons and it may take some trial and error to see if one works for you. MD Formulations Facial Cleanser is a creamy but water-soluble cleanser that contains 12% glycolic acid. This cleanser receives approximately four out of five stars from users at Makeup Alley. It was also given a high ratings by users on TotalBeauty.com. Where to buy: Various online retailers like Amazon. Other user comments: Several users on TotalBeauty appreciate that this is a great cleanser. One user on MakeUpAlley.com noted that she loved the product at first, but noticed "My skin started to get very irritated from this cleanser, probably it was too much to use every day for me." Summary: It appears to be a good cleanser but could irritate skin. 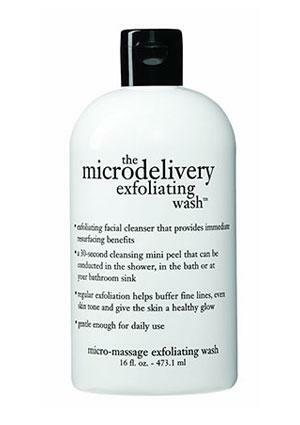 The Microdelivery Exfoliating Wash from Philosophy is a gentle exfoliating cleanser. This cleanser has been included in The Editors' Favorites for Allure.com and given a Cosmetic Executive Women Award in 2009. TotalBeauty.com users give this product high ratings and over 75% of MakeUpAlley.com users indicate they would use the product again. Beautypedia.com gives this product a rating of two out of five stars. Where to buy: Online retailers like QVC and Sephora.com. Other user comments: Several users on TotalBeauty.com note that this is a great exfoliator, describing it as "like a mini-facial." A user on Allure.com notes that "This is the type that you use daily for gentle work on your face, hands and chest area." However, several users on Macys.com expressed disappointment that the formula seems to have changed and includes few scrubbing beads. Summary: It can be a good daily exfoliator but can dry and irritate more sensitive skin types. 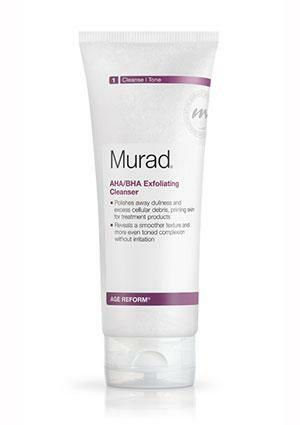 Murad AHA/BHA Exfoliating Cleanser is another cleanser/scrub that contains jojoba beads as well as AHA/BHA for exfoliation. Users on MakeUpAlley give this cleanser a high rating, and Beautypedia gave it three out of five stars. Other user comments: Over 60 users on Ulta.com note that this cleanser leaves their skin with a clean feel, while only a few individuals indicate that it does not work for them. A user on TotalBeauty.com says that "tiny Jojoba beads are luxuriously massaging!" Another user on MakeUpAlley.com did not like that fact that the product contained parabens. Summary: A combination cleanser/scrub that is a good product for most but may be out of some people's price range. 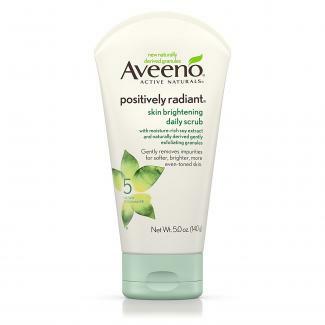 Aveeno Positively Radiant Skin Brightening Daily Scrub is a soap-free cleanser that contains microbeads and soy extract for gentle exfoliation. Experts at Beautipedia rate this product at three out of five stars, and Makeup Alley rates it even higher at about four and a half stars. Where to buy: Various drug and discount retailers. Other user comments: At Beautipedia, 67% of community reviewers say they would recommend this product. One reviewer said it exceeded her expectations in giving her clearer, smoother skin. Another user at Makeup Alley says the product does what it says it does, but it dries out her skin if she uses it more than once or twice a week. Summary: This product is inexpensive and is a good skin cleanser. While a daily cleanser containing an exfoliant will help clear milia, some sufferers find professional treatments work better and faster. If your milia has become burdensome, visit a dermatologist to discuss treatment options and prescribed cleansers. Bear in mind clearing any skin condition takes some time, so expect to spend at least a month implementing a cleansing and treatment plan prior to seeing any permanent results. Once your milia has cleared, you can practice the prevention techniques listed above to avoid any unwanted future outbreaks.